Home » Banking » Legal consequences with bounced cheques! Legal consequences with bounced cheques! A cheque is a negotiable instrument in India and is normally valid for three months from its date. Cheque bouncing is one of the most common offences in the country, with over 40 lakh pending cases in the Supreme Court. 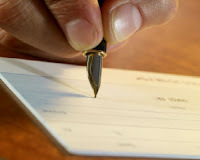 A cheque is said to be bounced when the payment stated on it is not made and it is dishonoured. The important point here is that when a cheque bounces, it is a criminal offence in India. Therefore under the Negotiable Instruments Act, 1881, the person who had issued the bounced cheque is punishable by heavy fine and jail term also. Almost every bank gives a ‘cheque return memo’ along with the returned cheque stating the reason for the bounce. If you hold the cheque, you need to inform this to the drawer and ask if you can re-present it to the bank within the 3 months period. If cheque is dishonoured even the second time, then you can take legal action. As a first step, you can send a legal notice to the defaulter within a period of 30 days from receiving the cheque return memo. The notice should contain all necessary facts of the matter, including the details of the first time the cheque was dishonoured. The defaulter needs to make a fresh payment within a period of 15 days from the receipt of this notice. However, if he still doesn’t make the payment within this time period, then you can file a complaint in the magistrate court. This case should be filed within a maximum period of 1 month from the date of expiry of the 15 days time period. In India, it is common practice for the landlord to take post dated cheques from the tenant. In case a rent cheque bounces, the landlord can follow the above procedure to recover the dues from the tenant. Sometimes, it may so happen that the tenant does not have the funds simply because the landlord did not drop the cheque at the expected time. Therefore, the landlord is bound to first inform the tenant and only then proceed with the legal process. There may be another case when the tenant wishes to set off an amount from a particular month’s rent towards some expense he incurred on behalf of the landlord, which the latter refuses to pay. If there is a cheque bounce because of this, the criminal case will continue against the tenant till he is able to establish that there was a legitimate set off. When a cheque meant for an EMI payment on a loan is dishonoured, the bank can also file a case against the defaulter. However, banks do not do this as the first step. Firstly, hefty penalties, loan default charges and cheque bounce charges are levied. These keep building up for every month of default and added to the EMI amount. Also, the defaulter’s credit rating gets affected with every default he makes. In case of secured loans, banks also have the security as collateral. If the borrower does not make payments even after repeated reminders, the bank can give sufficient notice and auction the security to recover the dues. If you receive a cheque from a business debtor and this gets bounced, then you should follow the above procedure to recover dues. In case of bounced cheques in business transactions, the added penalty would be the loss of face in business circles, affecting your reputation and business deals. Considering the huge number of pending bounced cheque cases in the courts, the Government is mulling to amend the Negotiable Instruments Act which will restrict the payee from taking the defaulted person to court. According to news reports, such a person who has defaulted in making the payment will not face jail term and the cases will be handled only through arbitration and settlement by Lok Adalats. This proposal has come under criticism from the common man, as it is believed that this will only increase cases of payment default. A more stringent and rigorous punishment should be put in place to reduce instances of bounced cheques in the country.